Yesterday was one of the Best Days Ever! 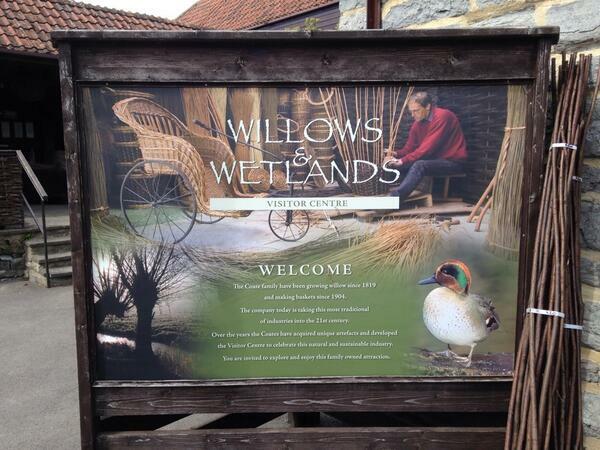 At the suggestion of Sarah Le Breton, one of the basketmakers who took part in the Stakeholders project, I went to visit the Willow and Wetlands Visitor Centre in Stoke Saint Gregory, Somerset – the home of P. H Coate & Son, willow growers and basketmakers. Coates started out in 1819 and is still a family business. I met Jonathan and Nicola Coate, and Jonathan’s mother Anne. Sarah and I started the day with a wonderful tour by Anne (I just wanted to scribble down everything she was saying), which included the history of willow-growing in the Somerset Levels and the history of the business, the museum collection of baskets (one of the main reasons for my visit), the methods of processing willow and, finally, the workshop where five makers were hard at work. In the afternoon, Nicola drove us round the withy beds which were badly affected by the flooding earlier in the year. Miraculously, Coates managed to harvest about 80% of its willow, but the silt on the stems of the unharvested willow showed just how bad the flooding was. 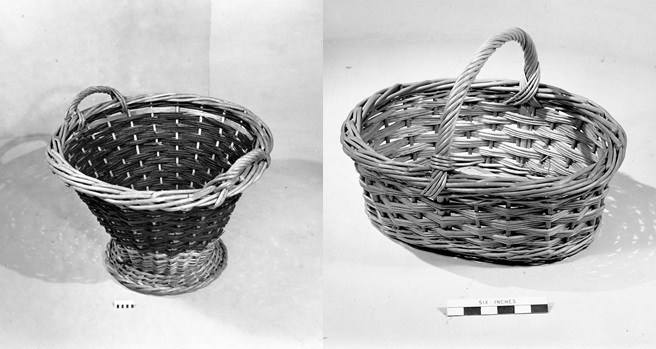 Two baskets at MERL made at Coates circa 1945. (L) MERL 60/457, potato hopper. (R) MERL 60/459, potato planting basket. With the collapse of the basketmaking industry after World War Two, Coates have had to diversify their offer over the decades – making new types of baskets (e.g. willow coffins), finding new markets (e.g. for films, TV and theatre), making new products altogether (in the 1960s Coates began to make artists charcoal), keeping beef cattle (it was traditional in the Levels for cattle or sheep to graze on the harvested withy beds to eat any early shoots) and, obviously, becoming a tourist attraction. Coates is an amazing place and offers a really unique experience. I sometimes feel like a bit of a heretic in the museum world because my true passion lies in keeping craft skills alive, rather than in keeping craft objects forever. I’m particularly interested in whether museums can play a role in ensuring the survival of a craft and what that role can be. I’m also really interested in exploring what can be done with smaller craft collections (be they in museums or otherwise) and the different ways they can be used. A beach chair, for protecting holiday-makers from the wind. They were available for hire in the same way as deck chairs are today. So for me, Coates is so wonderful because you can see the craft of basketmaking in its full context and appreciate that the survival of a craft relies on so much more than just the making of the end product. At Coates you can see the whole chain of basketmaking – from growing the willow, to harvesting it, and to processing it, and then using it. It’s a great combination – the focus is very much on the making (it is a business after all), which keeps the craft alive and ensures that skills are passed on, and is supported by the collection of historic English willow baskets which present the history of the craft from a museological angle. I came away full of ideas, and my mind was buzzing on the train home making links and connections between the baskets at Coates and those here at MERL. It was reaffirming to see similar baskets in both – it shows to me that MERL’s collection contains the right sorts of baskets. 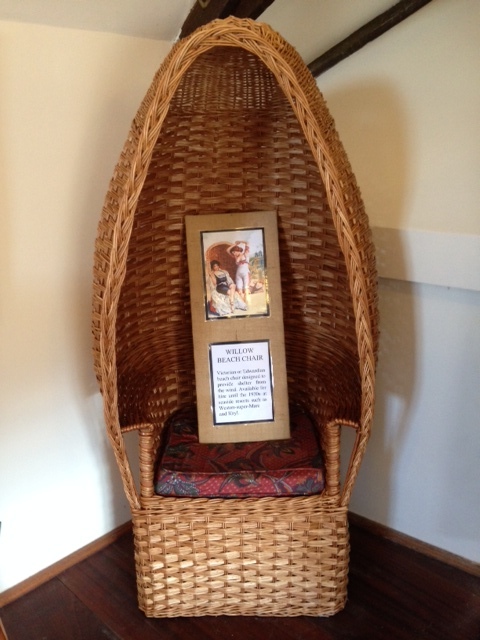 It was great to see crossovers – bushel baskets, picnic baskets, sparrow traps, singlesticks etc. It also confirms my love of baskets justification – that ‘anything and everything was made out of basketry’ – from pans for scales, to carriages for spinal patients, to hireable windproof beach chairs! The visit has also given me loads of ideas for blog posts and avenues to explore – I’ve been meaning to write something about our artillery shell basket for a while now and Coates had numerous wartime baskets, the most intriguing of which is a willow aeroplane seat from World War I, and Anne showed me a World War II government publication entitled ‘Baskets into Battle / from Willow to Weapons’. Thank you so much to Anne, Nicola, Jonathan and Sarah for making it such a wonderful day! I really hope I can visit again. I don’t know where to start…. I just read your blog and found myself asking, is that our business? It made me feel really proud. You visit certainly left me with my head in a spin, so many ideas to follow up, its all very exciting. Thank you so much for coming to visit and a huge thank you to Sarah for instigating and organising it. I think, before too long Jonathan and I will need to come to MERL for a visit. We were really grateful for your advice and guidance on how to go about beginning to catalogue our collection properly and for giving us a confidence boost about the task. Just a really good day- thank you. Just to let you know that I watched the DVD I got from Coates last night – it was brilliant! I really enjoyed it! I hope you received my email a couple of weeks ago with all the thoughts from my visit – I wasn’t sure that I had the right email address. We happened to visit Willows and Wetlands whilst on our holiday about a fortnight ago and I agree fully with all your comments. It’s a really fantastic place, business and collection! I was very interested in this article. I have been working with Sherborne museum and have met Nicola – we have been showing the wonderful DVD to many visitors in fact we have worn it out! I would really like you to get in touch with me as I have quite a lot to share and could learn so much from you. I am currently trying to find out about some wonderful hardwood three way and four willow splitters that we have had donated to the museum and I am trying to find out if they were made of boxwood.